Our offices are designed to provide a calm, uncluttered, and relaxing environment for adults and children. We do everything we can to create a quiet environment where you can just relax, or be productive, with our high-speed WiFi. Our swipe-in / swipe-out security system creates a secure and private experience. All of our customers receive their own key-fob so they can go run an errand if they like. TALK uses an aromatherapy program inspired by the most exclusive hotels in world to help you relax. Take a 360 degree tour by clicking on this link, or peruse the still pictures below. You can also check out our Google business page. Our business hours are 8:00 AM to 5:00 PM Monday through the Friday and 9:00 AM to 12:00 PM on Saturday. Our lobby, specifically designed for quiet relaxation. 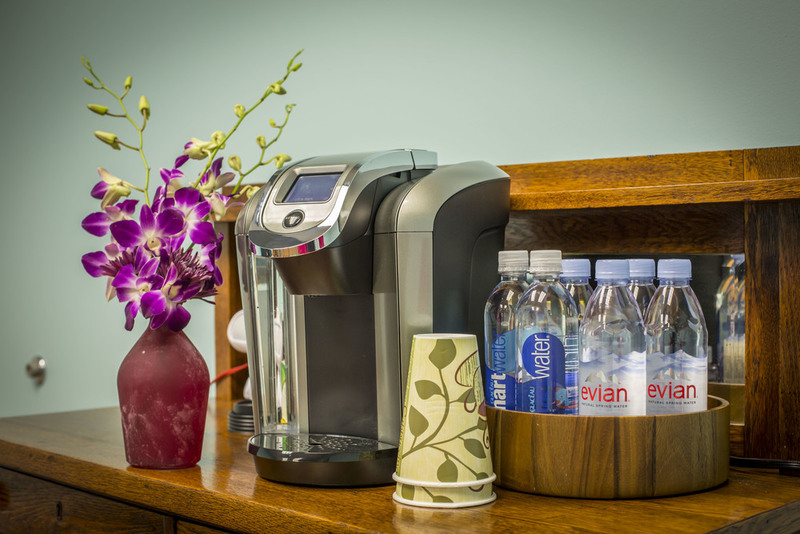 We offer free high-speed WiFi, coffee, tea, and bottled water. We specialize in play-based therapy designed to keep your children engaged and having fun while they work on their goals. Our therapy rooms are designed to be relaxing and engaging so your child can focus on progressing and achieving their goals. We have different rooms for different ages and different kinds of therapy. Our conference room where we keep parents up to date on progress and coach them on ways they can accelerate their child's therapy with things they can do at home.